Brisbane E Waste & Computer Recycling | 1800-GOT-JUNK? We live in a day and age in which technology takes giant strides towards new and more efficient electronic devices with each passing year. This means that state of the art gadgets, such as computers, tablets, smartphones and much more, become obsolete much faster than ever before, which only increases the amount of e-waste accumulating in landfills and other disposal locations, as well as taking up space in your home. The problem worsens when the components of the discarded electronic devices start degrading, which can cause pollution and other issues in your immediate environment. This happens due to humidity and the natural passage of time, so storing old electronic equipment for long periods of time does not only create an unsightly pile of junk, but can also be potentially dangerous. Whether your electronic devices and computer finally give out after years of use or you like to stay up to date with the latest technology on the market, the truth is that disposing of the old items can be quite a hassle. Environmental protection laws can make the disposal of e-waste and computers a daunting task, which is why, when the time comes for you to replace your devices, you should give us a call at 1-800-GOT-JUNK?. At 1-800-GOT-JUNK? we are aware of how problematic it can be to dispose of e-waste and old computers, which is why our specially trained professionals are proficient in this aspect of our services. Brisbane e-waste disposal and computer recycling are no longer a problem once you give us a call. Simply dial our number and one of our customer service reps will be happy to answer all your questions and provide a quote to which we will strictly adhere. We will never come up with hidden charges after the fact, the price we quote will be the final price you will pay. Once your appointment has been scheduled, our team of professionals will show up on time with a friendly smile on their face and will quickly and efficiently remove any and all e-waste you have accumulated, proceeding to deliver it to processing and recycling facilities to be sorted and reused, avoiding any further pollution of our planet. At 1-800-GOT-JUNK? we strive for perfection and take pride in the professionalism of our personnel. With us, you can count on an honest quote, trustworthy and transparent solutions, credible answers, and professional services. Our family of customers and clients are the living testimony of our core values. No job is too big or too small for us, and we are always happy to lend a helping hand for all your Brisbane e-waste and computer recycling needs. 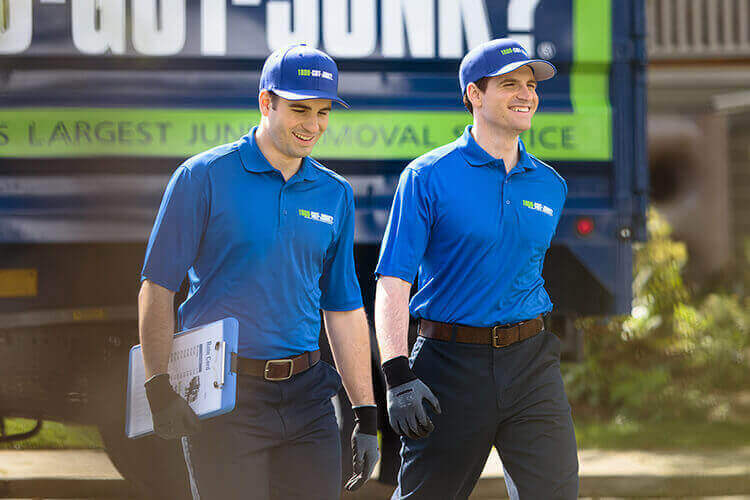 Our experience in the field has helped us streamline our processes, making them as easy as possible, keeping your satisfaction in mind, so give us a call and find out how simple it can be to put an end to your junk removal problems. Once you have scheduled your appointment, the first thing you can be sure of is that we will always show up on time. We understand how valuable your time is, so we will never be late, and we will also give you a call once we are on our way so you will know you can expect us to arrive soon. Our team of e-waste and computer recycling professionals is friendly and always happy to help, making this one of the best junk removal experiences you will ever have. The time to regain control of your personal space is now, so don't hesitate and give us a call at 1-800-GOT-JUNK? today!